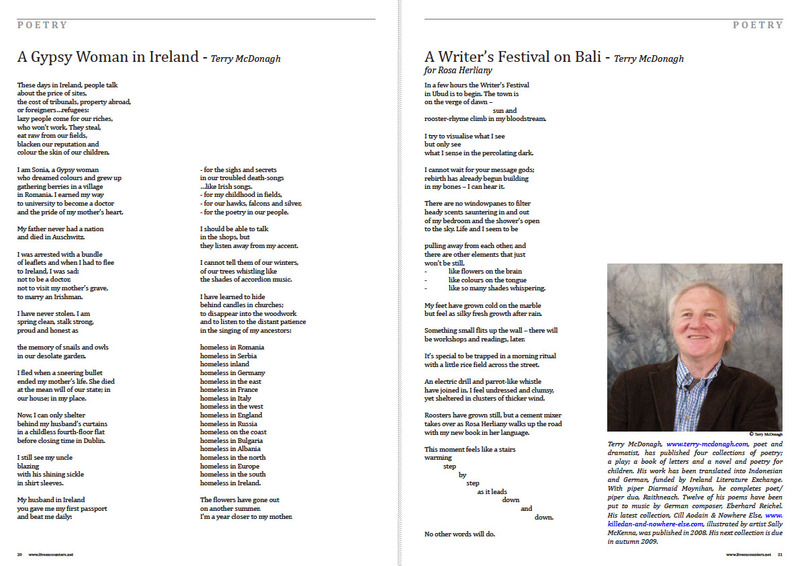 Terry McDonagh, www.terry-mcdonagh.com, poet and dramatist, has published four collections of poetry; a play; a book of letters and a novel and poetry for children. His work has been translated into Indonesian and German, funded by Ireland Literature Exchange. With piper Diarmaid Moynihan, he completes poet/piper duo, Raithneach. Twelve of his poems have been put to music by German composer, Eberhard Reichel. His latest collection, Cill Aodain & Nowhere Else, www. killedan-and-nowhere-else.com, illustrated by artist Sally McKenna, was published in 2008. His next collection is due in autumn 2009.